The delay of NASA's next Mars mission will allow an $800 million solar observatory to move out of launch limbo and into an opening in the Atlas 5 rocket's manifest next October. Officials formally approved the change Wednesday after negotiations with United Launch Alliance, the company that oversees the Atlas and Delta rocket fleets. "We're all happy," said Elizabeth Citrin, project manager for the Solar Dynamics Observatory. "It's a great Christmas present for us." The 6,600-pound satellite will blast off from Cape Canaveral between Oct. 8 and Nov. 6. The launch period was originally assigned to the Mars Science Laboratory mission, but agency officials delayed the probe's launch two years earlier this month to overcome a rash of technical hurdles. 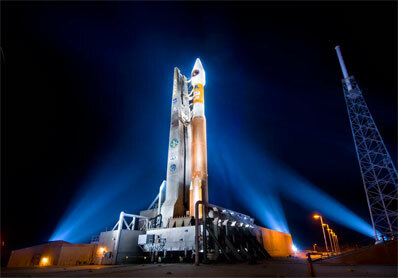 SDO was the victim of repeated delays in the Atlas 5 launch manifest over the past year. The issues were caused by both rocket troubles and problems with payloads. "It's very tight and everything's moving to the right," Citrin said. "It just wasn't a good time to be looking for a launch slot, so we're just happy we got one." The next available open slot on the Atlas 5 was in April 2010, more than a year after SDO was expected to be ready for launch. The project team was working toward a launch readiness date of Dec. 1. "We didn't have a firm date so we were at the end of the line waiting for someone else to get out of line," Citrin said. "It was always felt we were going to get something earlier than April 2010." The Atlas 5 manifest is stacked with missions to launch payloads for the Air Force, NASA and commercial customers. The next Atlas 5 launch, scheduled for early March, will orbit the Air Force's second Wideband Global SATCOM spacecraft. Next in line is NASA's Lunar Reconnaissance Orbiter, which will blast off in late April if workers can prepare another rocket in time. Other Atlas 5 flights from Cape Canaveral in 2009 will launch the commercial Intelsat 14 communications satellite and the Pentagon's X-37B Orbital Test Vehicle prototype space plane. The X-37B vehicle assembly is complete, but military officials are still working on a few final issues before the demonstration mission can proceed. "Testing of the OTV is complete and the vehicle is ready for shipment to the Cape, however there is still some progress that needs to be made regarding the mission ground station software readiness," the Air Force said in a statement. "We are currently working with ULA to determine launch priorities, availabilities, and readiness levels and are confident we will find an appropriate and timely opportunity to begin the maiden voyage of the first unmanned, reusable space test vehicle," officials said. The space plane was originally set to fly this month, but the launch was delayed this fall until March. Future launch opportunities are under review. An upcoming Atlas 5 mission is on the books from Vandenberg Air Force Base, Calif. That launch will carry an Air Force weather satellite into space late next year. Engineers at the Goddard Space Flight Center in Maryland completed the final round of environmental testing on the SDO spacecraft earlier this fall. The regimen included acoustic, vibration and thermal vacuum tests. "We've finished everything and pretty much buttoned up," Citrin said. 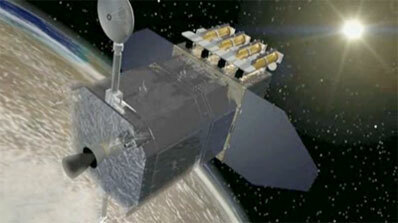 Scientists and engineers are conducting mission simulations over the next few months to prepare for the real mission. Officials will hold a pre-ship review in January to complete the required paperwork before transporting the spacecraft to Cape Canaveral next summer. 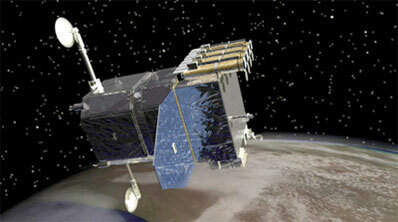 SDO's three instruments will improve measurements currently being collected by the SOHO and TRACE observatories. Those spacecraft, both more than 10 years old, are beyond their original design lives. "It's going to really help our understanding of what drives the sun and how it operates," Citrin said. "It will give us tons of data to develop models to predict space weather, which is sort of a big thing these days." SDO will fly in an inclined geosynchronous orbit over North America, in constant view of devoted dish antennas at White Sands, N.M. SDO's instruments will produce too much data to store in on-board recorders, officials said. The observatory will beam down about 1.5 terabytes of data per day, a significant increase over the data production rates of SOHO and TRACE. "It produces just a ton of data," Citrin said. "We send all our data down - full disk images of the sun 24 hours a day, 7 days a week."